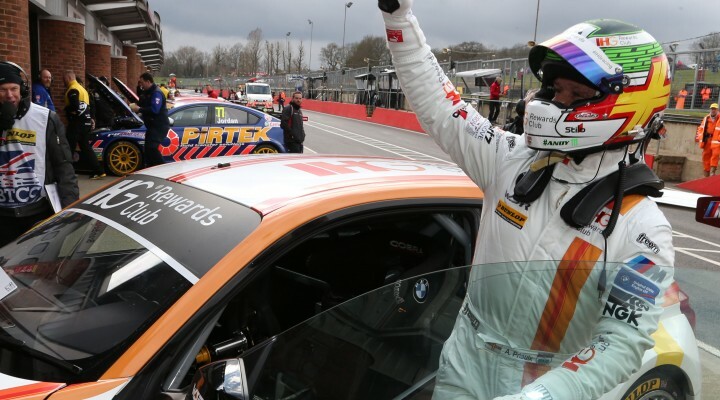 Three-time World Touring Car Champion Andy Priaulx has made an immediate impact on his return to the BTCC by claiming pole position for the season opener at Brands Hatch. The West Surrey Racing driver set his fastest lap shortly after mid-session before a stoppage brought a halt to proceedings. Several drivers improved during a final ten minute shootout but couldn’t match the 48.411s pace set by Priaulx. Aron Smith got the better of his illustrious Team BMR stablemates to take second, seeing off Jason Plato and Colin Turkington respectively – the latter of whom seemed to have his final flyer scuppered by traffic on the tight 1.2-mile Indy circuit. The BMW trio of Sam Tordoff, Rob Collard and Priaulx initially held a 1-2-3 in the order but the VWs and Hondas soon entered the fray. It was Plato who first attacked for top spot but it was champion Turkington that set a time quick enough for provisional pole. Gordon Shedden joined the battle in the brand new Honda Civic Type R, running as high as third early on, although the squad’s challenge faded in the latter stages. Collard held on to take fifth ahead of MG’s Jack Goff, who had endured an earlier spin. It had been a relatively low key day for the MG 888 Racing outfit but Goff’s late performance provided some relief for the reigning manufacturer champions. Team-mate Andrew Jordan, who had previously taken pole position in each of the last two season openers, could only manage tenth on his qualifying debut for the MG marque. Shedden eventually took seventh with triple champion team-mate Matt Neal down in 11th. Sam Tordoff claimed eighth on his first BMW outing, making it three WSR cars in the top eight, whilst Tom Ingram completed an impressive day with ninth in the all-new Speedworks Toyota Avensis. The mid-session stoppage was caused by Martin Depper’s Honda Civic, which had left the pitlane without one of its wheels correctly fitted. The Eurotech car trudged slowly towards Druids Hairpin before the wheel eventually came off, leaving the machine stranded close to the circuit. There were other off-track excursions for Dextra Racing’s Alex Martin and Power Maxed Racing’s Josh Cook, but both debutants recovered after trips through the gravel. There was little doubting who would be grabbing the headlines, however, and that was Priaulx. Returning to the series following a 13-year hiatus, the Guernseyman now leads the championship for the first time in his career by virtue of the point awarded for pole position. Click here for the final classification from the Dunlop MSA British Touring Car Championship qualifying session at Brands Hatch.